Guitarist/composer Pascal Bokar synthesizes American Jazz and its African musical and spiritual roots through a deep cultural connection. Born in Paris, raised in Segou, Mali and Dakar, Senegal, and longtime resident of San Francisco, Bokar has cultivated an impressive array of disciplines that reflect his unique experience: composer, guitarist, vocalist, bandleader, educator, author, club owner and curator of jazz history. The meeting of cultures personifies Bokar, from the movement of African culture via the Middle Passage to African-Americans of the slavery era, and continuing with the movement of African-American culture into the mainstream culture of the U.S., ultimately leading him to the embodiment of these deep interconnections. Throughout his productive musical career, guitarist/vocalist Dr. Pascal Bokar Thiam has always understood the connections between West African music and the sounds of the American South. His landmark book Timbuktu to the Mississippi Delta discusses the music of the three empires that dominated the culture of West Africa starting in the 6th century, tracing the music from its role in the culture and daily life of Africa to its eventual emergence in the United States. In his teachings, lectures and music (where he displays his own individual voice), Pascal has consistently paid tribute to his ancestors. “As a musician, I have always tried to synthesize the convergence of African esthetics and appreciate their influence in the music of the African American communities of the American South, from the rural sounds of the Blues and Gospel into this music we call Jazz.” Pascal Bokar’s American Shores, in the “AfroBlueGrazz” style coined by the album’s producer Greg Landau, is an ambitious fusion of textures and styles that comes from Bokar’s unique cultural perspective. As an accomplished jazz guitarist and scholar of African music and jazz he consistently heard clear examples of African musical concepts and instruments throughout his musical explorations. In this project he brought together accomplished musicians from Appalachia’s bluegrass style with Senegalese master drummers, African-American Rhythm and Blues singers, funky keyboards, and the stomp/clap percussion of a gospel choir. This eclectic cross cultural mix brings together long lost musical relatives as a platform for Pascal’s rich guitar and vocal improvisation. Pascal Bokar previous recording Guitar Balafonics was selected by Downbeat Magazine as one of the “Best CDs of 2015.” Pascal Bokar is listed in Jazz journalist Scott Yanov’s Book entitled Great Jazz Guitars. 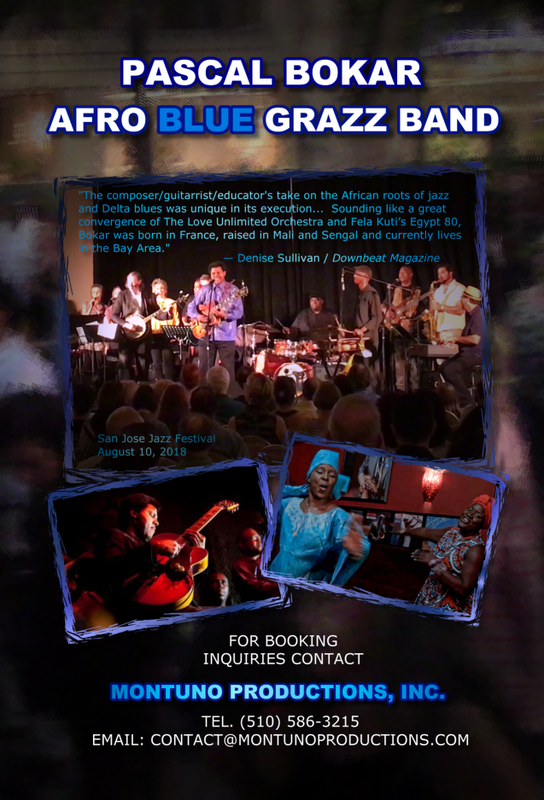 Dr. Pascal Bokar Thiam is also the owner of the Award Winning Savanna Jazz Club of San Carlos, CA, and is recipient of the Jim Hall Jazz Master Award from Berklee College of Music. Notable musicians on this record: fiddler Blaine Sprouse (Bill Monroe), bassist Tony Saunders (Eric Clapton & David Crosby), Gospel Hawkins Family, and keyboardist Steve Carter.